The Bere Island Heritage & Information Centre is the focal point for the conservation and enhancement of the Island’s unique heritage. 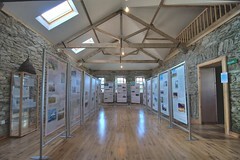 It is home to The Bere Island Experience Exhibition detailing the unique history and lifestyle of Bere Island, as well as temporary themed exhibitions throughout the year. 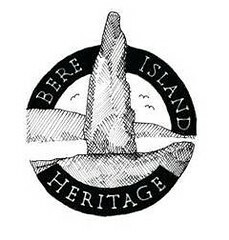 It is an important reference, meeting and information point for both islanders and visitors. The proposal to create a Heritage Centre from the Ballinakilla Old School Building built in 1857, became a reality in 2009 after members of the Old School Committee in partnership with Bere Island Projects Group secured funding from The ISLA Project, The Department of the Islands & Cork County Council, with the building work being carried out by local builder Jack Sullivan and Bere Island Construction, it was designed by DOD Architects, Kenmare, Co. Kerry. 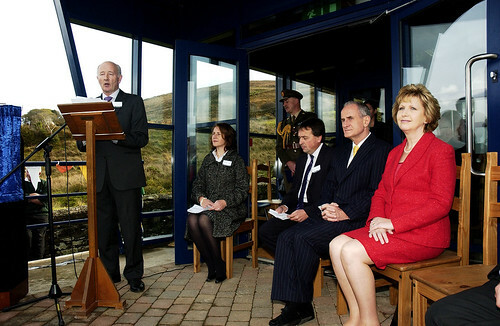 President of Ireland, Mary McAleese performed the official opening of the Bere Island Heritage Centre on Saturday 30th October 2010. On this most historic day, her presence and inspiring speech made the day for the people of Bere Island, and we were honoured that the President of Ireland Mary McAleese and her husband Dr Martin McAleese were able to share with us and acknowledge the importance of this day to our small island community. Annual Membership is available for the Heritage Centre and includes free access to all of our Exhibitions, free internet access and 10% discount in the Heritage Centre cafe. Heritage Week events are organised annually by the Heritage Centre, please check the events page for more details. Bere Island Heritage & Information Centre, Ballinakilla, Bere Island, Co Cork.